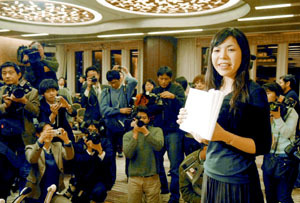 Nanae Aoyama only turned 24 in January, but already she has won literary prizes for each of the two books she has published. But she hasn’t just won any old literary prizes. 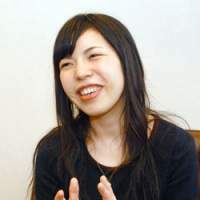 Her latest, awarded in January for her second novel, “Hitori Biyori (Being Alone),” was the Akutagawa Prize — the most prestigious in Japan — which is named after the great early 20th-century novelist Ryunosuke Akutagawa. In her 170-page work, Aoyama covers a year in the life of 20-year-old Chizu, a woman who does temporary jobs and lives in a room in Tokyo she rents from Ginko, a 71-year-old female relative. After drifting from one job to another — as a party-service staffer and a shop assistant on a station platform — Chizu is finally offered a full-time job at a water-purifier company. In her novel, Aoyama describes in language that is crisp, direct and also humorous Chizu’s daily life and her inner struggles through her relationships with her boyfriend, her divorced mother (who works in China) and Ginko and her boyfriend. 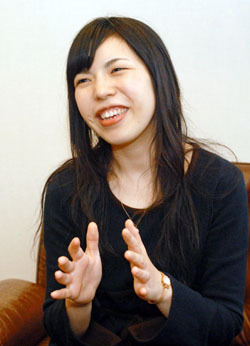 Since she graduated from Tsukuba University in Ibaraki Prefecture in 2005, Aoyama has had two books published — “Hitori Biyori” and her 2005 debut, the Bungei Prize-winning “Mado no Akari (Light of Windows)” — and has also held down a full-time job at a Tokyo travel firm. So, when I met her one recent Saturday afternoon at the Tokyo office of her publisher, Kawade Shobo Shinsha, it was hardly surprising that Aoyama said she had been working that morning at her regular job — a job she says she keeps, in part, because she feels she needs to know the world more. Wearing a navy-colored dress, she spoke calmly and chose her words carefully — but never once showed even the slightest hint of self-importance despite her exalted, award-winning status. She did, though, make clear that she wants to keep writing about the world as she sees it, “using every possible word she has.” But that’s not to say that Aoyama appears to be at all intense or self-absorbed; in fact our conversation was frequently punctuated by her laughter. How do you feel about the much wider readership that your winning the Akutagawa Prize will ensure? Oh, I am very happy. Also, I am now excited about the prospect of getting to know how the large number of readers, both male and female and of different ages and occupations, think about my story. I would like to hear all the opinions, both positive and negative, from the readers. What surprised me most about receiving this prize — and also made me feel happy — was the fact that my story was not rejected by the selection committee members who are totally different from me in terms of age and social position. I wrote this story only hoping that it might help make young women feel at ease with their lives, and that is why I was surprised that it was also accepted by people in other strata of the society. When did you first start to think about becoming a novelist? It was when I was a fifth- or sixth- grader at elementary school [11-12 years old]. I liked reading books and making stories. I did not actually write the stories down, but I was thinking about them in my mind, and I thought it would be nice if I could make a book from them. I had that thought in my mind until I actually started writing stories when I was in college. How are your stories born? Usually, I come up with the idea of the first scene or the last scene. Then what I do is fill in the story between the scenes — or, in other words, I connect the scenes. I rewrote and revised the details of the scene many times. But I had first got the image of the main character leaving the house where she was, and then being in a faraway place in the light, remembering the house. How did you come up with the theme of “Hitori Biyori,” in which the main character, a freeter, is becoming independent through living with an old lady? I started writing the story about a year after I got my current job in the travel firm. I began to get used to working in Tokyo and living in Tokyo by myself. But actually, when I was at university, I had been so afraid of having that sort of life. When I was studying at university, I thought I would never be able to have such a lifestyle. But in fact, it was not that difficult when I tried. Work is difficult, but I found that the overall life was easier than I had imagined. I had a hunch that I could write a long piece on that “actually it is nothing” idea. Also, I had another hunch that I could write a story to tell myself — as I had been feeling afraid of such a life — that it is actually not anything to be afraid of. What exactly were you afraid of, do you think? Well . . . entering a company; being a part of an organization; the routine lifestyle. Also, various complicated procedures that I wouldn’t be able to figure out (laughs) . . . to do with paperwork and filling in forms and all that. So, did you make a freeter the main character in order to write about the anxieties connected with committing to society? I thought it was important to write about someone who has yet to be a part of an organization. The main character, Chizu, is not a person who rejects being a part of society because of fear. She has work. She is motivated and is working, though she is doing part-time jobs. I wanted to write about someone who is motivated to work — but not to be part of any established organization. The government tries to encourage freeters to take full-time jobs, saying that if they don’t they may not be able to get proper work training and become part of the workforce to support Japanese society in the future. What do you think about that view? Well, I just wonder why people in politics try to encourage freeters to have full-time jobs. I don’t see any problems with such people who work and live by themselves, either doing part-time or full-time jobs. Such people may be short of money sometimes, and they may even have to borrow, but basically I don’t think of that as a problem. I am a full-time worker, but I am the same as those people in terms of working for and living by myself. I don’t know if freeters are a problem in society . . . they may perhaps be in a wider sense. Do you think your job at the travel firm has some influence on your writing? I don’t think there is a direct connection. I regard them as separate. I am working at the office to develop my confidence as a member of society. Like the main character of “Hitori Biyori,” I have been feeling a sort of complex about it being said that I do not know about the world. I think I need some more experience, and I think having my job in the office will help that. So, even after winning this prize, you don’t plan to quit your job and become a full-time novelist? No. I am not thinking about that, at least not now. I get up at 8:30; I leave home at 9; and I start working in the office at 9:30. Normally, I leave the office at around 8 in the evening and have dinner with friends. Then I go home, check e-mails and, if I feel like it, I work on my story for a few hours — or sometimes just for 10 minutes. I rarely watch my TV as its picture is not very clear. I don’t subscribe to a newspaper and I usually get daily news through the Internet. At weekends, I meet friends to go shopping or watch films. Sometimes, I stay home, unwinding, reading books and watching videos. Apparently, you like Franoise Sagan and Kazuo Ishiguro. Yes. I clearly remember what a shock I had when I first read Sagan when I was a high-school student. I was amazed to know that a writer of my age wrote such a story [“Kanashimi yo Konnichiwa,” the Japanese title of “Bonjour Tristesse (Hello Sadness)”], and I felt jealous. While reading it I could see the scenes vividly, even the shivering fingers of the main character. I was very much impressed with the book. I won’t be able to stop if I start talking about it. It is difficult, actually, to figure out. In the novel, the author makes the main character speak in the first-person singular, “I,” but even so I thought the main character talked less about herself than about her friends. I felt there was a certain blank in the story to do with knowing the main character. Because of that, when I read the story I tried hard to understand the feelings of the main character. But in the end, I thought that the main character might be actually refusing to reveal her feelings to readers — and to me, too, personally. I was impressed that the story was consistent in that sort of coldness. In your stories you reveal some of the main characters’ small habits. In the first one, the main character peeps into a room in an apartment across the way. In the second, the main character filches small things such as her boyfriend’s packet of cigarettes. What is your intention in presenting such characters? Since I was a high-school student, I have thought that I would like to write about people’s behavior that varies a bit from the norm. It’s not that I wanted to write about Peeping Toms or filchers. People can be beyond the norm in various ways, and these characters’ behavior may be beyond the norm — but I think such aspects enrich the story. I find humans interesting because they may have something that does not fit in with the norms. Do you see the “dispassionate” relationships like those in “Hitori Biyori” around you? Yes. People around me do not seem to be very passionate about their relationships. I, myself, am a passionate type, I guess. But talking to friends, I don’t hear about dramas in their relationships, and their relationships sound a bit flat. But I think it’s because they don’t talk much about them, probably, and actually they do have dramas, even though they just speak in a flat voice. The character in “Hitori Biyori” seems to think ahead quite objectively about what is going to happen next in her relationship — but actually, she is looking back all the time. I tried to create this type of woman. In your two novels, you wrote about the main characters’ (both of them twentysomething-year-old women) feelings of adoration toward older women. Do you also have such feelings? I often find interest in older women. I am also interested in the relationship between young people and older people. In the first story, I wrote about a young woman’s adoration, her envy and her strong curiosity about something she did not know through her relationship with a middle-aged woman. I have those kinds of complex feelings myself, and I put them into the story. In the second story, however, the main character actually does not try to know what she does not know in her relationship with the landlady. There is a gap of several decades between her and the old lady, but the main character does not care much about that. The main character’s words in “Hitori Biyori” often seem to expose her nihilistic view about being young. Do you feel uncomfortable with people’s tendency to revere youth? When I was a high-school student, I was a member of a music club where I played flute. Now, I sometimes look at the video of one of our concerts, and I feel so impressed with it even though the performance is terrible (laughs). I mean, I am deeply impressed with the fact that young students are playing music very seriously for all they are worth. I think that is doubtlessly a nice part of being young. However — and this may sound contradictory — I do not feel comfortable to hear people say that “you are young and that’s good” when I say I am 24. I can’t say it’s great that I am young. Well, being young is a bit of a bother. People say that “You are young — isn’t it nice?” But I don’t know how to reply, and it is difficult to answer these questions. Also, I imagine that many young people think about questions such as “Who am I?” . . . though I don’t do that much myself. If you have to think about these issues because you are young, being young is difficult. I envy older women because they seem to have cleared all the troubles that accompany being young. Japanese women in their 20s are often regarded as being materialistic and prone to buying brand goods. What do you think about that? I think it’s strange to talk as if all women are same if they are in their 20s. If someone likes brand goods very much, I think it’s just a part of her character. That’s fine. If she wants to buy them, she can buy them. If she goes bankrupt as a result, she will learn some lesson from the experience. I think it’s good that there are so many people with so many different characters. They may get in trouble or make mistakes because of their character, but what I’m really interested in is how they make the mistakes. Akutagawa winners, such as Ryu Murakami and Shintaro Ishihara, who received the prize when they were 24 and 23 respectively, later expanded their fields by, for example, dealing with social issues or getting involved in politics. What is the possibility that you might write about political issues or actually get involved in politics? I don’t think I will do that. Daily life is more important for me than big trends in society. I may change, but for the time being I think this is my stance. I want to write stories with a broader perspective, but also dealing with everyday issues. What stories would you like to write in the future? I would like to write stories that I want to write at each stage of my life, and that I cannot write any other time but that time. When I published the first novel, I never thought of myself as any kind of “star” writer, but I just hoped I might be able to keep writing for a long time. If I don’t keep writing, I thought at that time, there was no sense in having published a book. So, my continuing to write does not necessarily mean that I will keep taking the same stance every time. I believe that I will see the world differently, and I will think about the world differently, when I get older. What I would like to do is to keep expressing what I see, and what I think, using every possible word I can muster.